"A six fingered fist of Neanderthal Black Metal for you here. PRIMITIVE GRAVEN IMAGE scrape their riffs from the blood painted walls of fire lit caves. We are talking the contemporary view of Neanderthal though, rude intelligence instead of knuckle-dragging savages. 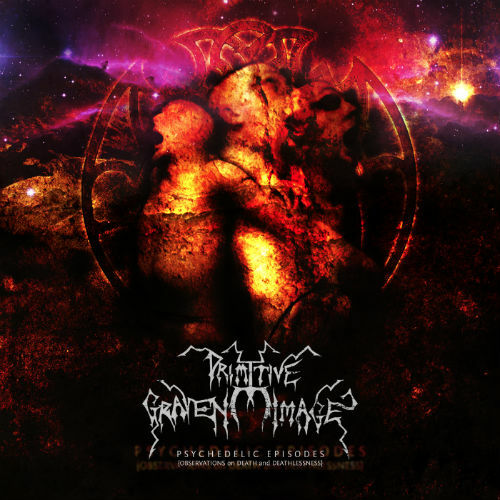 PRIMITIVE GRAVEN IMAGE convince from the start on this demo and leave you thinking in no uncertain terms by the end that their debut is worth looking forward to." 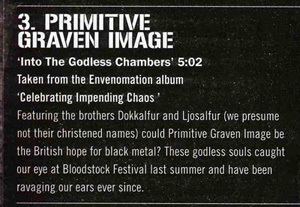 - Metal Observer, Nov 27 2006. 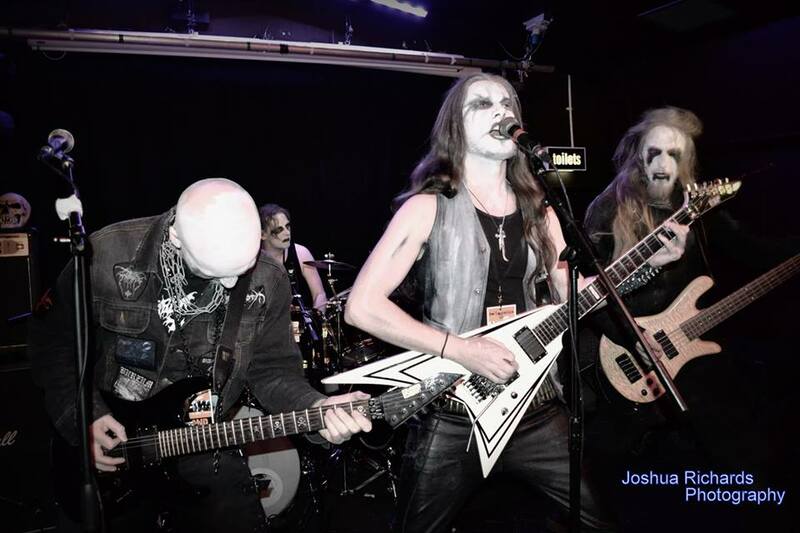 "Good black metal with a lot more feeling and emotion than most other black metal bands I have heard. They don't just play fast for fast sake and create more of a mood and emotion along with feeling with their music. I am sure the debut will be a masterpiece of black metal." - Metalcore Webzine. The room was rammed and we were packed in like sardines but this just added to the intensity and there was room at the front to snap a few pics of the band in their corpse-painted finery. Looking good and sounding good too, the mix was different to downstairs as rather than bass heavy this was all sharp and snappy and with vocals added you could also say particularly snarly too. Drummer Vordhr is particularly ferocious driving the pace along and firing out a cymbal smashing tumult on songs such as ‘Design’ from their earliest album ‘Traversing The Awesome Night’ Indeed it was darkness that surrounded us from the atmosphere and with the ricocheting percussion it sounded as though we were under attack from snipers as it volleyed off the walls. We celebrated the impending chaos with ‘Into The Godless Chambers’ with vocals giving a surprise as some high pitched trad metal warbling suddenly invaded amidst the otherwise frost bitten scorn. Apart from this operatic surprise you could almost imagine the likes of Carpathian Forest spitting this out and I certainly enjoyed seeing the band in action at last. Hopefully it won’t be the last time either.